Physician organizations have a significant opportunity to maximize program efficiency by leveraging the most cost effective institutional providers. To capitalize of this opportunity they must have an accurate assessment of potential opportunities as well as an ongoing ability to track actual results. Develop practice level analytics to measure performance within groups for each health plan arrangement. Track member attribution at the group and pcp level. Analyze gaps in care and target additional reimbursement opportunities at the PCP and practice level. Customized reporting to reflect internal distribution of gains and losses at the group level. Long-term success requires physician organizations to select the most competitive and efficient network partners. Further efforts must be devoted to aligning long term financial incentives among all key providers. Measure and track utilization by provider and by disease category. Provide cost differentials among providers for similar services. Deploy custom reporting to measure alternate payment arrangements with delivery system partners. As more provider organizations accelerate the shift to population health, the level of financial risk will correspondingly increase. In anticipation of this moment, organizations must adopt systems capable of tracking the impact of this change so that they can avoid the mistake of ill-fated predecessors who blindly entered such arrangements. They must also promote internal harmony by early establishing internal rules for the sharing of gains and losses. Create equity by insulating internal risk bearing groups against high cost cases and uncontrollable risk. Provide analytics that measure and track the results of risk-based arrangements. Develop reporting solutions that recognize the lean operating structure of physician organizations. Continuously focus upon the engagement of physician leadership. 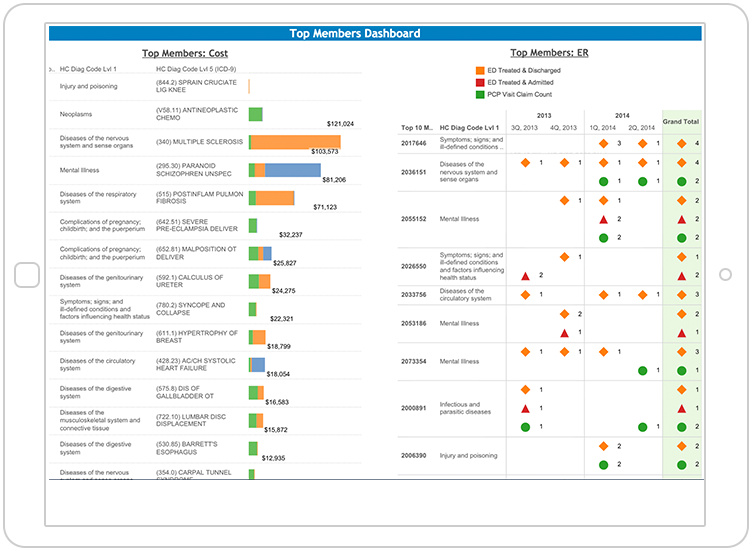 Track performance with fully customized dashboards at the practice and PCP level within and across payers. Monitor out of network utilization by provider and disease category.